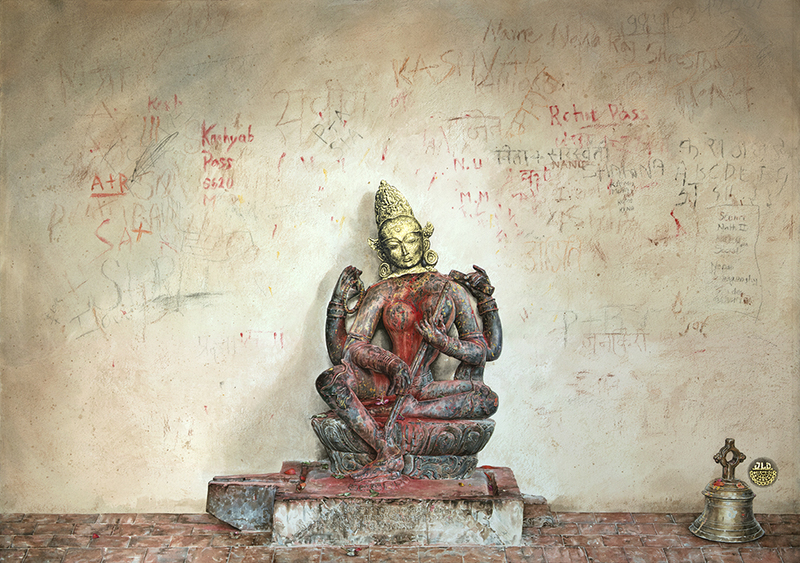 Paintings are available as limited edition giclée prints, with all proceeds benefiting the non-profit Himalayan Art and Cultural Heritage Project, Inc. (501c3 status pending). 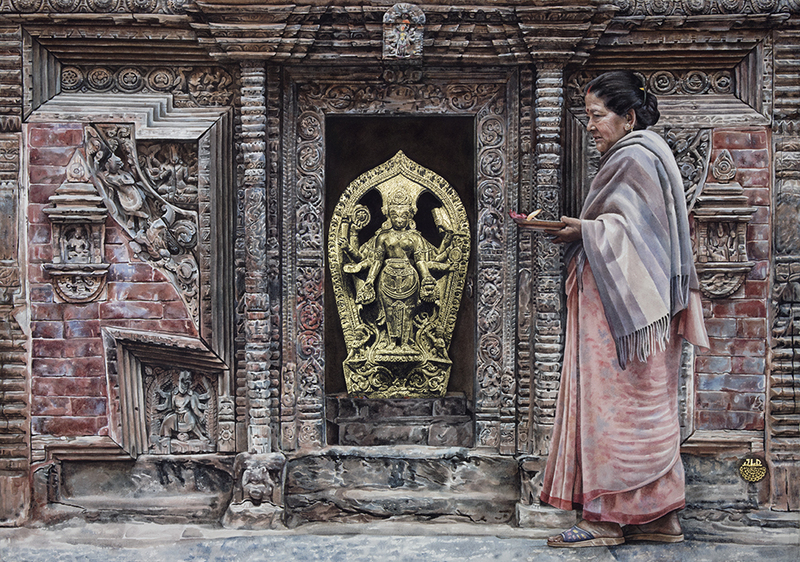 The Himalayan Art and Cultural Heritage Project works to celebrate and protect the artistic and cultural heritage of Nepal and the greater Himalayan region by promoting public awareness and education, encouraging scholarship, supporting preservation efforts and the continuation of artistic practices, discouraging illicit-traffic and facilitating voluntary returns of cultural artifacts. The original image was painted with acrylics and 23 karat gold on cotton rag paper. It was painted entirely in Nepal, though in several locations. I started it in my home in Patan while I had a terrible fever, later worked on it in my painting studio with the Kathmandu Contemporary Arts Centre in the Patan Museum, and finally finished it while staying at Namuna Ghar in Bhaktapur. Before I began, I made many visits to the site where this gorgeous sculpture resides in the lovely hill town of Pharping, in southern Kathmandu Valley. She is Saraswati, the goddess of knowledge and creativity. In the early 1980’s her head was stolen, forcing worshippers to leave offerings on the neck. The head was later found and returned from abroad. It now resides in Nepal’s National Museum. The community has commissioned a new head and worship continues. The graffiti on the wall was done by local children, who ask her for help passing their courses. The children’s writing warms my heart. It’s sweet and funny. On the right, a student lists a very long list of classes he or she is struggling with. Another writes their name “+Saraswati” in Nepali. And my favorite – another writes “I love Niva” then crosses out “Niva”! The original image was painted with acrylics and 23 karat gold on cotton rag paper. 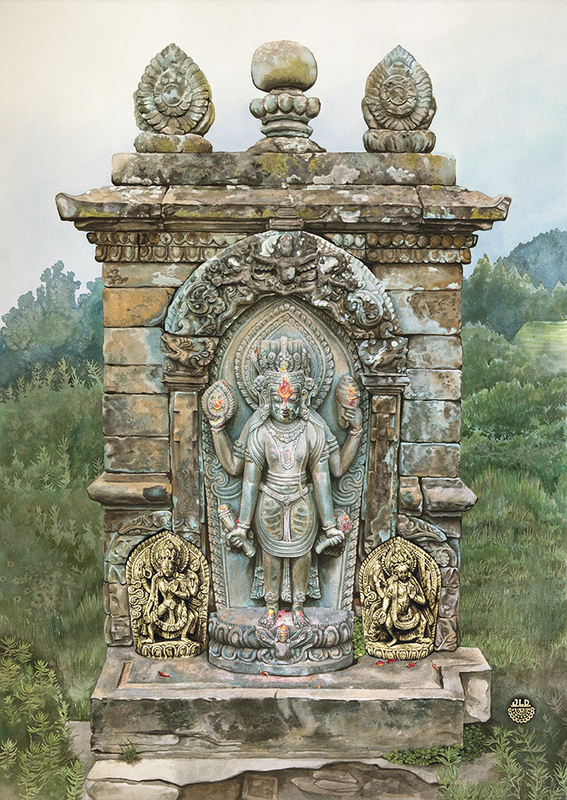 It was painted entirely in Nepal, though in several locations. I started it in my home in Patan while I had a week-long fever, later worked on it in my painting studio with the Kathmandu Contemporary Arts Centre in the Patan Museum, and finally finished it while staying at Namuna Ghar in Bhaktapur. Before I began, I made many visits to the site where this gorgeous sculpture resides in the lovely hill town of Pharping, in southern Kathmandu Valley. She is Saraswati, the goddess of knowledge and creativity. In the early 1980’s her head was stolen, forcing worshippers to leave offerings on the neck. The head was later found and returned from abroad. It now resides in Nepal’s National Museum. The community has commissioned a new head and worship continues. The graffiti on the wall was done by local children, who ask her for help passing their courses. The children’s writing warms my heart. It’s sweet and funny. On the right, a student lists a very long list of classes he or she is struggling with. Another writes their name “+Saraswati” in Nepali. And my favorite – another writes “I love Niva” then crosses out “Niva”!